U.S. Patent No. 7,210,161 on "automatically transmitting images from an electronic camera to a service provider using a network configuration file"
U.S. Patent No. 7,742,084 on a "network configuration file for automatically transmitting images from an electronic still camera"
U.S. Patent No. 7,453,605 on "capturing digital images to be transferred to an e-mail address"
U.S. Patent No. 7,936,391 on a "digital camera with communications interface for selectively transmitting images over a cellular phone network and a wireless LAN network to a destination"
The complaint against HTC lists the following devices: the HTC EVO View 4G, Flyer, Jetstream, Vivid, Amaze 4G, Desire, Evo Design 4G, Hero S, Rezound, Rhyme, Sensation 4G, and the Wildfire S. All of those are Android-based. While the complaint is explicitly "not limited to" those products, it appears, at least for now, that Kodak's lawsuit is not targeting Windows Phone devices such as the HTC Titan. 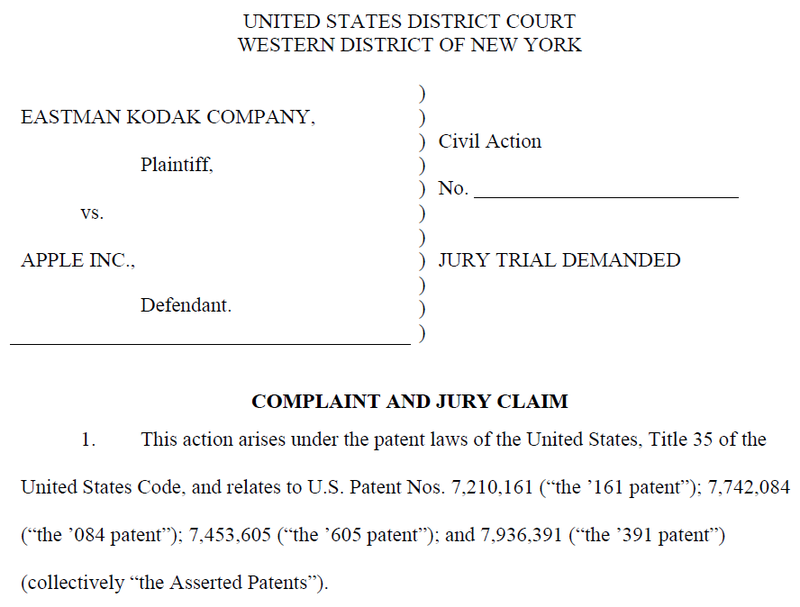 While Apple and HTC are suing each other, they will probably cooperate with respect to the patents Kodak is asserting against both of them. At the very least they will probably conduct a joint prior art search, and they could also be interested in narrowing the scope of the asserted patents claims so as to avoid liability for infringement. Kodak has been trying for some time to find a strategic buyer for its digital imaging patents. 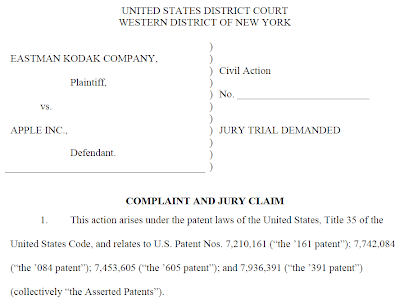 Today's lawsuits are presumably part of the sales and marketing effort for those patents: Kodak seeks to demonstrate that there are still some interesting assets in its portfolio that can be used to sue major wireless device makers.